If want your home to have major curb appeal, you should consider iron entry doors Houston. Installing wrought iron on your property can give it a dramatic face lift. Many homeowners looking to change the tone of their home’s exterior use wrought iron to do so. It is easy to clean, and lasts a very long time. Those two reasons alone make it the perfect material for entry doors. The fact that it tends to increase your home’s value is an added benefit. Not all wrought iron exterior doors are the same. It is important to avoid buying doors made with inferior materials. These doors will not last as long and may cause you more problems than they are worth. In some cases, using a cheap door now can lead to expensive replacements in the future. As well as avoiding dishonest companies, there are a few other things you should keep in mind. Take a look at the following tips to help you find and buy the door of your dreams. Once you know how to find the perfect door, visit Southern Front Stained Glass and Doors. Their wrought iron door prices are affordable, and they use high quality materials. Visit Southern Front in store or online at http://www.southernfront.com. Prospective customers can contact Southern Front by calling 281-890-5860. They can provide customers across the U.S. and Canada with the perfect doors for their homes. Take a drive or walk around your neighborhood to see if there are any wrought iron exterior doors you like. Cities tend to plan out neighborhoods at the same time. As a result, the homes in your immediate area may have similar exterior aesthetics as yours. If they have installed wrought iron doors, there is a chance the same style would look good on your home. Driving around can also help you pick out your preferred style quite fast. Paging through catalogues can be fun, but is time-consuming. Looking at doors in the “real world” can also help you envision how the door will look on your home. Sometimes it can be hard to get a clear picture from looking at a catalogue alone. Once you have a style in mind, visit Southern Front to see their expansive collection. You can view their products online at http://www.southernfront.com or in store. Customers can also contact Southern Front by calling 281-890-5860. Custom options are available if you cannot find the exact door of your dreams pre-made. There are many styles of these types of doors available. Some styles are rustic and old-fashioned. Other, more modern iron doors are also very popular among homeowners. Before you settle on a modern-styled door, be sure it will fit with your home’s preexisting decor. The architecture itself is also important. A home with vintage touches and gothic architecture would not look right with a modern door. It is important to love your door, but it is also crucial that the door fit in with your home’s general look. Of course, if you have your heart set on a modern design, there may be ways to make it work. You can upgrade your other exterior decorations to match a modern style. If your architecture does not lend itself to a modern style well, ask your vendor about custom designs. You might be able to combine rustic touches with a more modern design. Southern Front has a wide selection of iron doors available. They offer doors with rustic and modern touches. Southern Front Stained Glass and Doors also sells custom models. Their customers are sure to go home with a door they love. You can view their existing products online at http://www.southernfront.com. Contact them by email or by calling 281-890-5860 to discuss custom options. Think about buying wrought iron interior doors as well as exterior ones. You do not need to limit wrought iron to exterior decor. There are many places in your home that would enjoy the addition of wrought iron. This metal adds a lot of charm and elegance to any area. Renovating your home’s exterior is the perfect time to upgrade a few rooms inside as well. One perfect place for a wrought iron gate is your laundry room. Many homeowners wish this area looked more inviting and welcoming. Adding wrought iron is a great way to give it an instant improvement. You can also let yourself get inspired by the addition of that type of door. Think about using wrought iron decorative touches throughout the room as well. These types of doors are also perfect for large rooms and in the place of French doors. If you are looking for wrought iron doors, visit Southern Front today. They have a wide selection of both interior and exterior doors for every home’s look. Interested customers can contact them by calling 281-890-5860. You can visit them online at http://www.southernfornt.com to see their pre-made options. Southern Front is happy to discuss custom models with customers as well. They want to be sure that you are happy with your door for years to come. Finding the perfect wrought iron exterior doors is easy if you follow the tips above. Be sure to focus on your own tastes and preferences, as well as the door’s composition. These two factors play a big role in how long your door lasts. Homeowners that hate their exteriors tend to renovate more often. This tends to cost them a lot more than purchasing a high quality door they love the first time. A final piece of advice is to never shy away from custom options. Customizing a door is often the best way to find the perfect one for your home. It is well worth the time and investment. After you have a style in mind, visit Southern Front today. They can help you find the perfect interior or exterior door of your dreams. Visit them in store or online at http://www.southernfront.com. Prospective customers can also contact Southern Front by calling 281-890-5860. 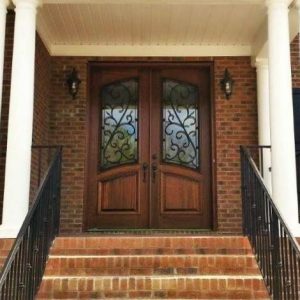 Southern Front is the perfect place to go for iron entry doors Houston. We have thousands of doors available in on our online store. Find the right door for your home.